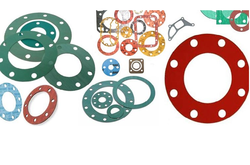 Manufacturer of a wide range of products which include caf gasket, non metallic gaskets, sponge silicone gasket, silicone gaskets and ptfe envelope gasket. Used In High Temperature And High Pressure. AF/Non-Asbestos Gaskets are die cut or circle cut from compressed asbestos fibre / non-asbestos joinings which are manufactured from carefully selected fibre intimately blended with suitable heat resistant binders etc. and vulcanised into sheets of homogenous compositions and uniform thickness. CAF/Non-Asbestos cut gasket seal is effected by yielding or flow of material into the imperfections of joint contact faces. In this way, gasket provides an unbroken barrier of the homogenous structure through which no pathway exists for the escape of confined media. Asbestos made of high quality's long asbestos fibre, rubber and heat-resisting packing material, compressing it to thick paper. Non-Asbestos Jointing Sheets are made of special non-asbestos heat-resisting fibre, heat-resisting packing material, and special rubber compound heating and compression moulding it. Please refer to Non - Asbestos Fibre Jointing Sheets to select the type of Material required depending on temperature and pressure requirements.Uses: Used in the high temperature and high pressure. For the equipment in saturated vapour, super hot vapour, gas, air, gas, ammonia alkali, and inert gases and other mediums etc. And used as sealing material in the joints of the pipeline. Sponge Silicone Gasket is extruded from advanced step moulding and microwave curing processes using high quality raw materials. This provides them a glossy finish and a uniform surface. 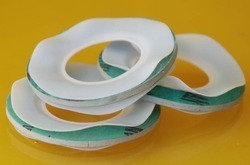 These sponge gaskets are available in different colors, shapes and hardness. Laxmi Rubber Industries offer its clients complete reliability and durability in our range of products. Available in round square and rectangular cross section. Colours are avilable in white, red & orange. Complies to FDA21 CER 177.2600. 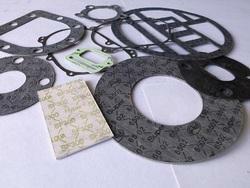 We can manufacture Silicone Gaskets to any dimensions and in any shape. Whether you are after a standard part, or something bespoke, simply give us a call or send us your drawing, and we will be happy to offer you a quotation. Silicone rubber gaskets are known for their chemical inertia and as such are useful in extreme environments, and temperatures from -55°C to +300°C. Slitted Type : It is available in 0.5 mm to 0.5 mm thick or thickness as per customer requirement. Milled Type / U Type : It is available in manufactured with 0.5 mm flange gas per customer requirement.Envelope gaskets are also available with Asbestos / Non-asbestos Steel Filler.